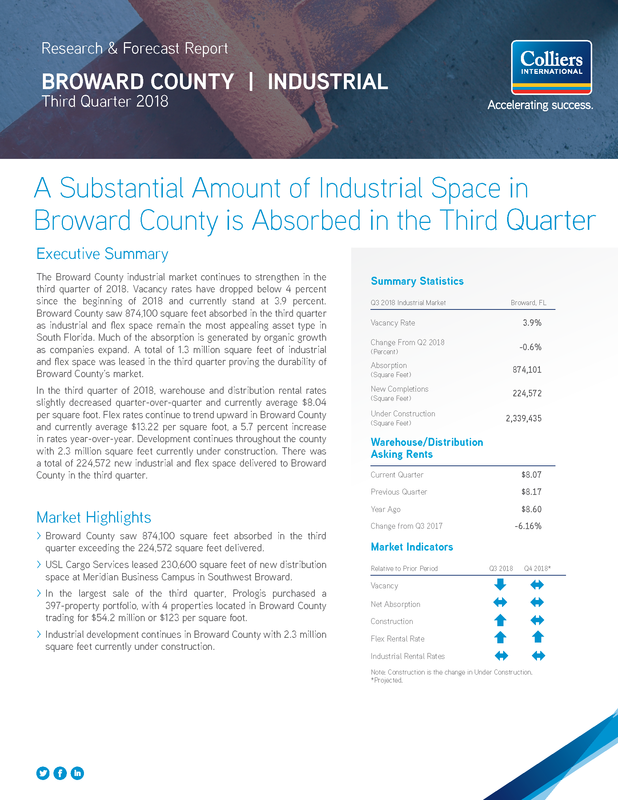 The Broward County industrial market continues to strengthen in the third quarter of 2018. Vacancy rates have dropped below 4 percent since the beginning of 2018 and currently stand at 3.9 percent. Broward County saw 874,100 square feet absorbed in the third quarter as industrial and flex space remain the most appealing asset type in South Florida. Much of the absorption is generated by organic growth as companies expand. A total of 1.3 million square feet of industrial and flex space was leased in the third quarter proving the durability of Broward County’s market. In the third quarter of 2018, warehouse and distribution rental rates slightly decreased quarter-over-quarter and currently average $8.04 per square foot. Flex rates continue to trend upward in Broward County and currently average $13.22 per square foot, a 5.7 percent increase in rates year-over-year. Development continues throughout the county with 2.3 million square feet currently under construction. There was a total of 224,572 new industrial and flex space delivered to Broward County in the third quarter.